The Chinese foreign ministry says China opposes the act of splitting the country. Amid the escalating Catalonia crisis, China offered the Spanish government its “consistent and clear” support. On October 27, Catalonia declared independence from Spain after a disputed referendum. Minutes later, Madrid announced it would resume direct rule of Catalonia. On October 30, Spain’s state prosecutor called for charges of rebellion, sedition, fraud, and misuse of funds against the former Catalan leaders, while the former regional president has already left for Belgium with other members of his administration, according to Reuters. 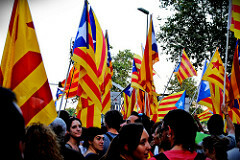 China’s position on this issue has been consistent and unequivocal…We understand and support the Spanish government’s effort to uphold national unity, ethnic solidarity, and territorial integrity, oppose the act of splitting the country and undermining the rule of law, and believe Spain is capable of upholding the social order and safeguarding the rights and interests of its citizens. Generally speaking, China tends to oppose most independence or secessionist movements around the world, since China itself is struggling with advocacy for independence in various regions. Against this backdrop, China’s position on Catalonia crisis is in line with its domestic policy. At the recent press briefing, Hua mentioned that China is “paying great attention” to the situation in Catalonia. Unless Beijing actually does what outside critics fear, it doesn’t help to act like Hong Kong’s reform process is over.